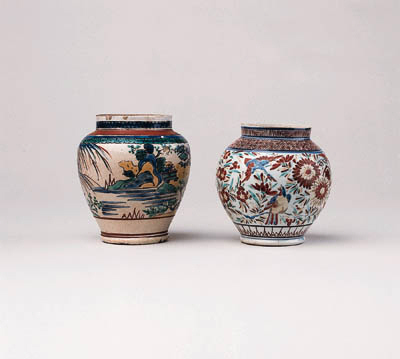 Similar vases of various sizes to the first are illustrated in Nihon Toji Taikei, vol. 20, Kakiemon, pl. 8, Imaizumi Motosuke Shoki Arita to Ko-Kutani, pl. 85, Hayashina Seiyo Nihon no Toji, vol. 9, no. 42, Nihon Toji Zenshu, vol. 24, Kakiemon, no. 10 and Ashmolean Museum, Eastern Ceramics and other Works of Art from the Collection of Gerald Reitlinger, no. 159. The design with the two birds placed amongst dense foliage is reminiscent of Chinese decoration. Similar examples with covers are illustrated in Nihon Toji Taikei, vol. 20, Kakiemon pl. 16, and in Japanese Ceramics in the Toguri Collection, (Toguri Museum of Art, 1988), pl. 254, which is in the Toguri Museum, in Eastern Ceramics and other Works of Art from the Collection of Gerald Reitlinger, (Ashmolean Museum, 1981), no. 214, and in Nihon no Toji, vol. 9, pl. 81. Another with a replacement cover and a European silver-gilt handle was exhibited in Porcelain for Palaces, no. 80.